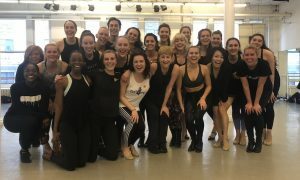 In writing this article, I was motivated by the fact that as I travel around the U.S. judging competitions and doing master classes, I am struck by the fact that the majority of the choreography that the studios create is geared toward dance competitions. In my own career, even though I am giving students material which could be used in competition, the majority of what I choreograph is designed to entertain audiences at large. In thinking about this, I realized that many of the teachers are there for choreographing for a narrow and specific objective. Choreographing for competition seems to be focused on the judging, with audience’s reaction and enjoyment taking a back seat. Conversely, being a working choreographer throughout the industry is dependent on audience acceptance and enjoyment, which is hopefully the goal of those producing the shows and events, and hopefully is the goal of those wishing for a career in professional commercial dance. Personally, I consider entertainment an art form as valid as any other art form. I have noticed that the initial idea for so much of the choreography we see comes from either a particular piece of music or an effort to show off the skills of a particular dancer or group of dancers. This is certainly valid, but I feel that many teachers could expand their choreographic horizons if they reached for inspiration outside of those objectives. I personally find it gratifying that there is music that inspires us to choreograph and perform, as my original education and my degree are in music. I feel that one is well advised to spend more time listening to a piece of music before choreographing even a step. If it is music with substance, it will help guide your movement. Some music lends itself to showing skill wherein the dancer seems akin to other athletes; some lends itself to musicality where the dancer becomes like one of the musical instruments showing dynamics and syncopation. Some music can portray a story, and as I judge around the country, I always feel a little “bravo” for those who do indeed tell a story that is clear and easily understood by an audience, whether it be dramatic, comedic or intended to have a moral. That thought pivots me to thinking a little further outside the box. One of the sources of choreographic ideas can come from our own life experiences. But be careful with this because the audience has to be able to relate to it…and yes, I do include judges as part of the audience. As we go along, we need to keep reminding ourselves that as people, we have a range of emotions, and sometimes just being able to convey a particular emotion and “touch” the audience can be very fulfilling. I find that we tend to categorize and limit ourselves by thinking that only certain genres can portray certain emotions. Along with story and/or emotion, I think it’s very worthwhile to spend time emphasizing characterization. We have all seen dances in which a particular dancer seems to stand out and grab our attention because of their individual character and personality, but I am referring to portraying a particular character as a challenge to becoming a stronger performer. 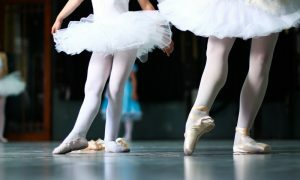 While all of us in dance realize the value of good synchronization and execution, I often see performances in which the dancers seem to be “cloned.” I think that detracts from the human element. Era (Occasionally, we see retro pieces that bring back the style of a certain era — roaring ’20s, disco. If you are portraying a certain era, you have to decide if it is to be authentic or if you wish to take poetic license to enhance entertainment value. We may disagree as to what makes a dance piece successful. My personal challenge to you as a choreographer would be to ask yourself, “Would it reach an audience? Did it make me a better choreographer? Did the experience of learning, executing and performing the piece make the dancer or dancers better?” So the challenge is a simple one: Are you willing to expand your choreographic horizons by taking a chance? By Tony Coppola of Dance Informa.